Much is made of the Mets having the best Opening Day record among all 30 Major League teams. That record expanded to 37-20 in what was Mickey Callaway‘s first game as the manager of the Mets. Considering the Mets have had more losing than winning seasons in their history, we know those good times do not keep rolling on throughout the season. Looking throughout Mets history, as the excitement of Opening Day fades, so does the Mets record. In the 56 year history of the Mets, the team’s record in the second game of the season is 28-28 (.500). The record does get a little dicier from there. In those previously famed 36 wins, the Mets have followed them with defeats in 20 of those games (.444). When it comes to the Cardinals, the Mets are now 6-2 against them on Opening Day. The Mets are also 2-6 against them in the second game of the season. When looking through the Mets managerial history, there have been 12 managers who made their debut with the Mets on Opening Day. Of those 12 managers only Joe Frazier debuted with the 1976 Mets by winning his first two games. That year, the Mets would finish 86-76. That would also be the last year the Mets would have a winning record until 1984. As an aside, Frazier, Willie Randolph, and Yogi Berra are the managers to begin their Mets managerial careers on Opening Day to have a winning record in their first season as manager. Willie’s and Yogi’s Mets both lost the second game of the season. Unlike Frazier, both Willie and Yogi would take Mets team to the postseason in their second season as the Mets manager. Of course, past is only prelude. It is not determinative of what will happen in the future. Just because the Mets won their opener, it does not mean the Mets have just a 44% or 50% chance of winning that game. Really, with the Mets sending Jacob deGrom to the mound, you’d have to believe the Mets odds of winning are much better than that. Having watched the Mets win on Opening Day, it seemed like this was a different Mets team. It felt like this was a team that is going to surprise us this season and really set themselves apart from Mets teams from years past. That’s part of the fun of Opening Day. Who knows how long this feeling will last? Perhaps, we will find the answer later today. 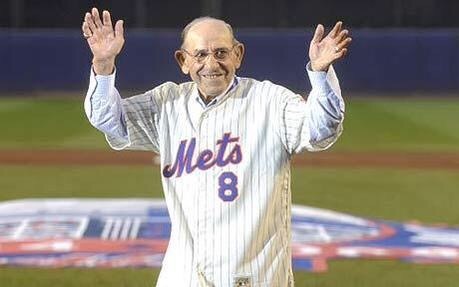 With the passing of Yogi Berra, i figured i should ask a Berra-Mets trivia question. With Berra ending his playing career with the Mets, and with Berra managing the Mets to the 1973 pennant, i thought the quiz should see if you can name the former Mets players who managed for them. Good luck! Earlier this year, the Mets organization embarrassed themselves by not having a patch to commemorate the late Nelson Doubleday. I hope the Mets don’t repeat the mistake with Yogi Berra. He deserves to be honored with a patch.